Yes! You’ve guessed it – we’ve hit Problem Number 149! Someone in the dim and distant past seems to have fitted two mis-matched inlet manifolds to the engine. One cylinder bank has a 2.0L inlet manifold whilst the oher bank has a 2.2L manifold. Whether this was a mistake or one manifold was replaced with the next best fit – we’ll never know. Undaunted by this latest challenge that my engine has thrown at him – Steve dispatched the 2.0L manifold to the engineering shop to bore it out to 2.2L specification. Things had seemed to be going so well as the throttle bodies had finally come back to Jaz from the engineering shop having been bored out and fitted with machined alloy sleeves. The throttle butterflies had also been rebushed and the individual butterfly flaps had been honed to a perfect fit within the throttle bodies to ensure optimal control of the air flow into the cylinders to mix with the high pressure mechanically injected fuel. The throttle bodies were fitted to the engine the same day they arrived leaving only the inlet manifolds and air supply paraphernalia to be bolted together.The last thing Steve expected to encounter was mis-matched inlet manifolds but the bore difference was only apparent on assembly and not on dis-assembly. I’m hoping this is the final hurdle we need to overcome in order to get this wretched engine onto the dyno but experience suggests that I should continue to expect the unexpected! I just spoke to Steve and as I suspected – expanding the cylinders bores on the 2.0L manifold is not as straightforward as initially thought. As you’ll see from the photos of the manifolds – only central cylinder bore is vertical and the ones either side are angled. This means that trying to do the bore expansion work on a lathe would invove the intricate set-up some sort of ealborate frame or a number of frames to “present” each inlet manifold cylinder at precisely the correct angle to the boring tool. Tooling-up for this simply wouldn’t be cost effective but the engineering copmpany Steve uses seem to relish a challenge – and they’ve had these in abundance with various bits of my engine. They’ve opted to create a reaming tool which Steve can keep and use in any future encounters with mis-matched inlet manifolds. Anyway – my reamed manifold should be sorted in the next couple of days and then it’s a case of bolting on both manifolds, air tubes, air boxes and the silencer onto the engine and off to the dyno we go. Fingers crossed! Id not heard anything for a while so I was a bit concerned that some further problems had materialised. Consequently – I called Steve to check on how things were going. Steve explained that reaming out the bores of the 2.0L manifold was proving to be much more difficult than expected. Although the manifold is cast magnesium – the metal is proving to be particularly hard and it is repeatedly blunting the reaming tools. Steve’s apprentice has effectively had a body building course over the last few days using the reaming tools on the manifold but his efforts have only resulted in 1 and a half of the 3 inlet manifold bores being sufficiently bored-out. This has forced a rethink and the engineering shop has come up with the idea of using a screw thread tapping tool to cut away some of the metal before resorting to the reaming tool again to take away the rest of the metal to leave a smooth internal bore face. All of this is having to be fitted in between a flurry of other urgent work at Jaz but the good news (for me) is that Jaz and the Dyno place will both be working between Christmas and the New Year so I still might get the call from Steve to get up to Aylesbury to see the engine being run-in and finally set-up before the New Year! 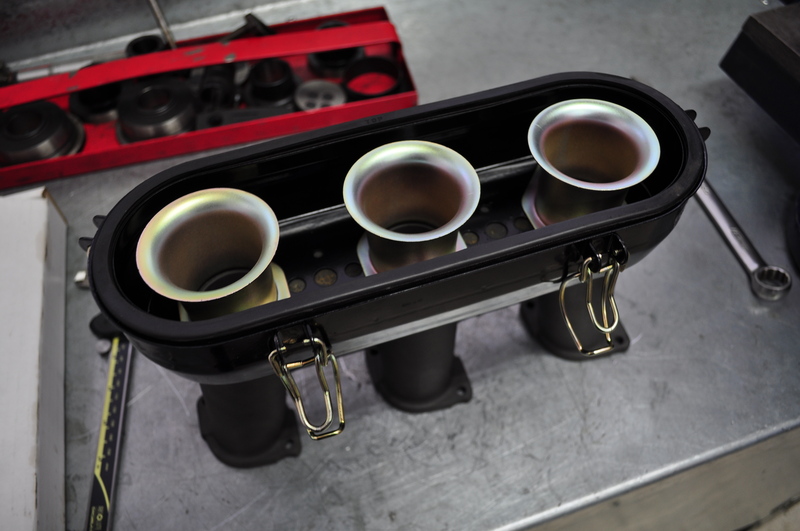 With all of the problems presented by the mis-matched manifold – Steve got quite excited when NEW inlet manifolds popped up on the Porsche web site. Upon closer inspection however – they turned out to be “E” manifold who’s bores are bigger than on the 2.0L manifold but are still smaller than the bores on the 2.2L S manifold. It’s amazing how bespoke the parts are on the different capacity/performance-rated engines of this period. Whilst it has always been easy and sometimes common practice to interchange entire engines with all of their ancillary components between different era body shells – it’s not so easy to mix specific engine components across the different engine types. Unfortunately before I bought the second hand S engine – someone indulged in some serious mixing and mismatching and this has left Steve and his engineering suppliers with the problem of sorting out the mess they created. Oh well – nearly there – I hope!